Streaming Nonsense is a podcast that reviews those straight-to-video movies you see listed on streaming services that you were always curious about. Reviews will contain spoilers, but we’ll try to avoid giving the biggest details away. Movies are graded on script, acting, and execution using a five point scale for each. New episodes will be posted on Mondays. The regular hosts are Bryan Mission and Sam Brown. 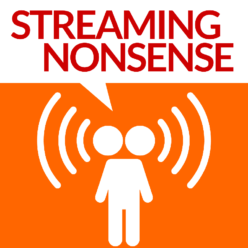 Streaming Nonsense logo created by Neil Sorenson. Intro and outro music created by Bryan Mission.